Something from my bar whenever I feel like it episode CXXVIIIsteemCreated with Sketch. I'm really cheating for this episode. Still don't feel like going down to the bar so I'm going with something that should be in my bar. 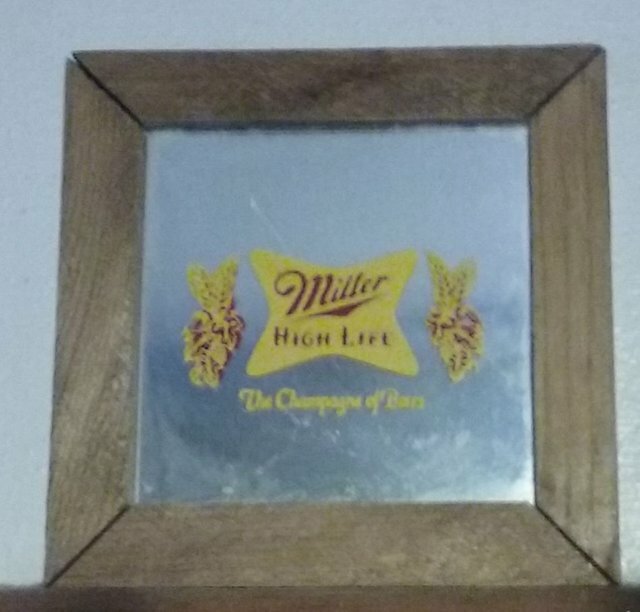 This one is a small mirror with Miller High Life on it. This is probably the oldest beer thing I have. I won it in at a carnival when I was in high school. I used to have a bunch of these with different beers and rock groups on them but as far as I know this is the only one that survived all these years. It's also the only one that was in my room where it has stayed all these years. That's why it never got moved to the bar. It has seniority and stays where it is. It's also why it's so dirty. It's been up above my window where it's hard to get to. All the others I had on the wall in our shed. They fell off and broke over the years. Some may have been taken down when I was in college but no idea where they may be.